With currencies and share / stockmarkets around the world crashing and ordinary people losing a lot of money I thought I might cheer you up by reviewing “Trading Places” and “The Bank” – 2 movies with a stockmarket / finance theme where the little guy wins in the end. “The Bank” is an Australian movie that will provide catharsis for anyone wanting to see the mega-corporations of the world get their just desserts. Jim (David Wenham) is a gifted mathematician who swears he’s found the right combination of chaos theory and fractal geometry to allow him to predict the rise and fall of the stock market. Ruthless Centabank CEO, Simon O’Reilly (Anthony LaPaglia) sees this as an opportunity to make a killing because Jim’s specially designed software promises to forecast financial market trends so accurately that its owner can make a fortune in a matter of hours, leaving millions to face financial ruin. Welcome to the world of The Bank, ripe with avarice and corruption, where O’Reilly and his ilk can thrive and honest Aussie battlers lose everything. Trading Places differs from The Bank because it’s a comedy not a drama and was made 25 years ago whereas The Bank was made quite recently. However both deal with similar themes of greed, avarice and the callous treatment of ordinary people by the managers of powerful financial organisations. The plot revolves around a one-dollar bet between the fabulously wealthy but morally bankrupt Duke brothers (Ralph Bellamy & Don Ameche) over an experiment in social darwinism to determine whether heredity or environment have the most influence on financial success. They arrange for impoverished street hustler Billy Ray Valentine (Eddie Murphy) to be placed in the lap of luxury. Simultaneously, they strip wealthy Louis Winthorpe III (Dan Aykroyd) of his identity and wealth. When Billy Ray figures out that the brothers intend to send him back to his life of poverty once their experiment is complete, he seeks out Winthorpe, and together they plot their revenge on the Duke brothers by manipulating the market in frozen orange juice futures. Both movies look totally different, but both look equally interesting. I think they should be good and I will definitely go for them. I love the Rotten Tomatoes reviews of movies. There’s nothing worse than reading a review only to find that the ‘critic’ must have either been drunk or paid for their review. Often Rotten Tomatoes seems to have a similar review to that of my own, which can save a couple hours of ones life prescreening flicks. I hadn’t heard of “The Bank” before. But Anthony LaPaglia is always good; although he never seemed to *really* great his break in Hollywood. The premise of it sounds almost too true not to be copied from a real story. My University was holding a conference, and one of the principles of a big Hedge Fund (Noble Prize Winner in Economics) was invited as keynote. Two days before he arrives his company totally implodes – basically their algorithm only worked within certain parameters. Credit where credit is due; the guy showed up and gave the speech. If I was responsible for the loss of billions, I think I would have hid. i loved trading places. 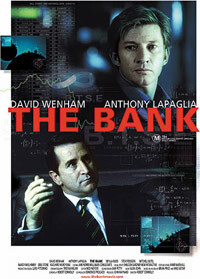 i will try to catch “the bank” in the local video store. 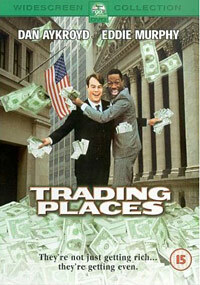 Trading Places is one of the best movies from the old days. Eddie Murphy was really good back then too. Thanks for the cool review and you are right, a few laughs during this time of year with this economy are much needed.